I find the conventional wisdom when it comes to properly using AI and implementing a positive candidate experience fundamentally flawed. 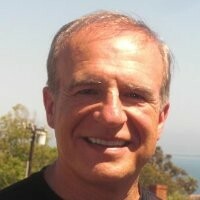 My issue rests on the premise that talent leaders are solving the wrong problem. Take a look at the image below. If you agree that the factors on the left that are used to screen candidates don’t predict performance and, worse, inadvertently exclude the strongest and most diverse talent, you recognize the problem. Consider that most companies write job descriptions that emphasize skills, experiences, and competencies. This is labeled “01 – Basic Wants” in the graphic. 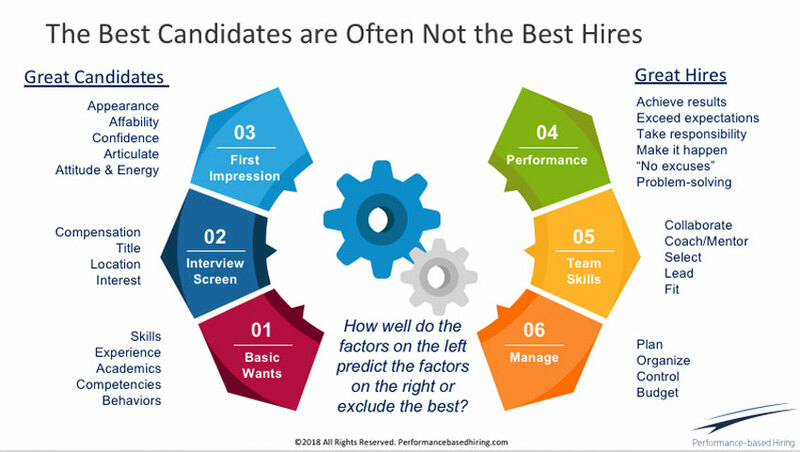 Candidates either apply based on these factors or are sourced this way. AI is used to make this process more efficient. Qualified candidates surfaced this way are then screened – often with knockout questions, a chatbot, or a human box checker (02 – Interview Screen). The purpose of this is to make sure the person falls within the salary range and, if so, is interested in pursuing an ill-defined but “awesome” lateral transfer at some company, in some location, with great people and with some title. This is akin to agreeing to a set of preconditions without any context about the real job or the associated terms. If the person passes through these hurdles, a one-on-one video or in-person interview is then arranged. If the person is on time, prepared, interested in the job, outgoing, confident, has a good handshake, makes eye contact, can communicate well, and has a professional appearance, he/she is judged as a serious candidate (03 – First Impression). In this case, the interviewer starts selling the person on the merits of the job and asks leading questions to prove competency. On the other hand, if the person falls short on the first impression factors, he/she is instantly judged as less competent and the interviewer asks questions to prove the emotional and negative assumption. It doesn’t take much data or insight to prove that the factors on the left have zero or are negatively correlated with those on the right. For example, we’ve all met people who achieve great results with a different mix of skills and experiences. All of these people are automatically excluded from consideration using the factors on the left. We’ve all also met people who make great first impressions but are not top performers and we’ve met top performers who don’t make great first impressions. We’ve also met great performers who will negotiate the terms of an offer if the job represents a great career move. To make a stronger negative correlation case, as part of the total population consider all of the great people who saw the job post or email but didn’t apply because they were interested in career growth, not a lateral move. Of course, a person needs some threshold level of skills and experience to be in the game, but this is a variable depending on the potential and learning ability of the person being chosen and the coaching and leadership skills of the hiring manager. In fact, one could easily prove by definition alone that 100% of the people promoted internally do not possess the required skills and experience required when screening a person from the outside. Also consider the fact the different criteria used to promote these people is far more predictable than the criteria used to screen those who apply since most promotions work out successfully. To me, it’s much simpler to be respectful at the front door rather than after someone has entered it. For example, why not use your postings to describe some truly great opportunities that require prospects to submit a sample of their work demonstrating their prowess? This will instantly reduce the prospect pool to 2 - 3% of the initial total. Then treat this small group of people like royalty. The #1 U.S. labor attorney validated this approach and considers it superior to current attracting and screening techniques. Based on what I’m seeing, in 3 - 5 years AI will be able to surface performance qualified prospects who meet the right-side criteria AND who would see the open job as a true career opportunity. This involves a much more complex set of decision variables to consider involving two buyers – the company and the prospect. But nothing will change until companies recognize that filtering on skills, no matter how efficiently it’s done, will exclude the best candidates. Bridging this conceptual gap, it turns out, is one of the biggest challenges.